Please join us for the launch and community discussion about Guildford Energy – the first community owned solar initiative in Perth. Come hear about community energy projects in Australia and overseas. 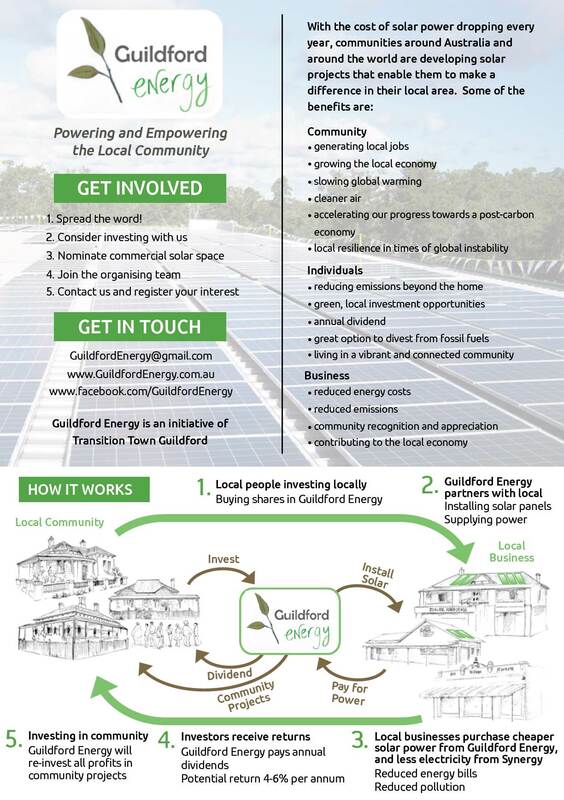 What Guildford Energy is about, and our initial thoughts – could Guildford and surrounds go solar? Share your ideas and tell us what you’re interested in? Find out how you can be involved….investor, business, organiser? Join us on Tuesday the 25th of March, 7 – 8:30 pm at The Stirling Arms Hotel function room (117 James street, Guildford). Come and help build the future of Guildford’s Energy! This entry was posted in Climate Change, Community, Economics, Energy, Event, Guildford Energy and tagged Community energy project, Community owned solar, Energy independence, Guildford Energy, solar initiative, Stirling Arms Hotel. Bookmark the permalink.